Home Uncategorized This “Grill Story” Will Burn Your Pants But…. 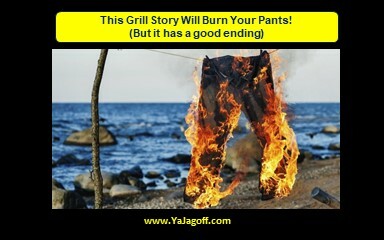 This “Grill Story” Will Burn Your Pants But…. When in need of handyman type things I do not claim knowledge. But that includes anything from screwdrivers, since there are many types that apparently have many jobs for many different things, to light fixtures and even bulbs to even proper paint types that apparently are not just glossy and flat anymore. However, my ability to pick up on poor customer service from any of the hardware havens from Busy Beaver to Ace to the heavy hitters like Lowes and Home Depot, is easy and immediate. Disclaimer: I needed a grill as a gift for my husband and it was 8:30 pm with a closing time if 10. Still not too bad, right? I politely asked the 20 something gentleman at the desk for help at the grills. He asked, “What for?” I answered just to bring it over to check out, I’m not sure how to do that. He said, “just slide it, it’s not that hard.” My glaring stare prompted his coworker to call the greenhouse area and ask for some help. The newly hired, maybe 17-year-old, greeted me while chewing and said, “What do you need? Is this it?” Yes was my answer as he already started showing me how to lift and slide it. I ignored her screaming and somehow got the grill to my vehicle, and what happened next? I could not lift it let alone figure out how to get it into the back of my traverse. Did I mention that dimensions are also my weakness? Then, like a knight in shining armor, and old school military worker showed up to make it all work. He called his assistant, a new hire, and proceeded to explain how both customer service work, and how to disassemble the grill as to not scratch the inside of my car. He restored my faith in the gorilla of hardware stores and made me realize that he may have been in cahoots with my husband….why? Now we need a larger vehicle for instances like this. Yeah, way to be the knight in orange armor, Mr. I’m so helpful…YaJagoff!